Walmart has a new awesome, convenient service, Walmart PickUp! Shop for your groceries online, then pick them up in-store. It saves you all that time of walking up and down the aisles! 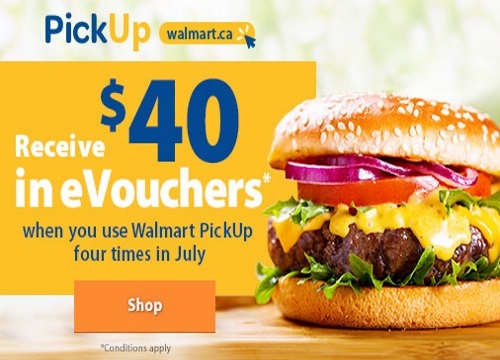 Also now as a promotion get $40 in Free eVouchers when you use Walmart PickUp four times in July! Just schedule and pick up grocery orders four times between July 1-31 and they will add two $20 eVouchers in your Walmart account.